Thank you!! This utility is so much better than eeepc-acpi-utils that I was using before. 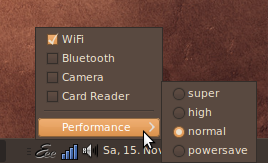 is this available for other distros than Ubuntu? and for other DEs than GNOME? Thanks a lot for that peace of software! REAL GREAT on my EeePC 1000H. Allthough it took me a few hours to find out how to disable the asus_eee kernel module. From that on, the new tray applet (and all the modules behind) works like a charm! Thanks for this tool, it looks like it’s working great on my new 1005H! I installed it with Ubuntu 9.04 Netbook edition. You can use the –kernelsourcedir option to tell DKMS where it’s located. Wooops! I hit the ‘submit’ before I could beg for help! Will there be a version for Karmic as the Jaunty version does not install on my EeePC1000HE I get the following message. Thanks for a great utility it worked well on Jaunty and I miss it. So it doens’t work in Karmic? I had it working for a bit when I did an upgrade, but then after it wasn’t working quite right I did a re-install… and now it wont install. Same error as Lapog. Where can i get the eee-ctl for Ubuntu 11.04? 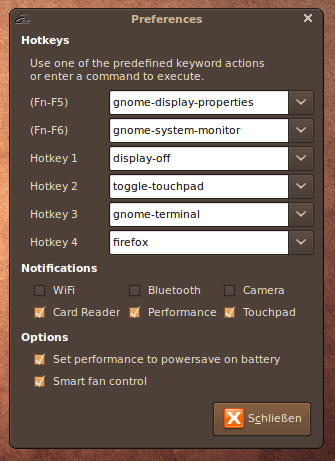 I’m interested in this for Ubuntu 11.04 too!